Discover an unrivaled oasis in Arizona's Sonoran Desert. Located only a short distance from downtown Phoenix, this luxurious resort and spa elegantly blends Native American culture with today's modern world. Experience an endless variety of activities and adventure at the Sheraton Wild Horse Pass Resort and Spa. With 2 on-site golf courses, an equestrian center offering lessons and trail rides as well as 4 spacious swimming pools, there is something for everyone. The hotel also boasts a first-class spa, featuring authentic Native American healing treatments. After visiting the nearby Wild Horse Pass Casino, enjoy a gourmet meal at the Sheraton Wild Horse's on-site restaurants. Watch the sun set over the mountains or Gila River from private balconies or patios, or enjoy an evening walk on the hotel's outdoor trails. Near a variety of corporate offices in the Phoenix suburb of Chandler, this hotel offers convenient services and relaxing amenities, just minutes from attractions and activities. Hampton Inn Phoenix - Chandler is surrounded by championship golf courses, great restaurants and world-class shopping. Attractions such as the Chandler Center for the Arts and the Arizona Train Museum are nearby. Guests at the Chandler Hampton Inn will enjoy free high-speed wireless internet access and a complimentary morning breakfast. In the afternoon, guests can go for a swim in the outdoor pool or work out in the fitness center. Right off Interstate 10, just south of Phoenix, this hotel in Chandler, Arizona offers guestrooms with free wired and wireless high-speed internet access as well as an on-site restaurant. Radisson Phoenix Chandler features an outdoor pool with whirlpool and a fitness center. Guests can spend the day at one of the nearby championship golf courses. Southgate restaurant at the Chandler Radisson serves breakfast, lunch and dinner. After a busy day, guests can have a drink in the lounge or enjoy a private meal from the hotel's room service. Located in Chandler, Arizona, this hotel offers a free daily hot breakfast and free high-speed internet access. The Chandler Fashion Center is within one mile of the hotel. Every suite at the Homewood Suites by Hilton Phoenix Chandler Fashion Center provides a fully equipped kitchen. The suites also feature an iPod docking station and a coffee maker. The Chandler Center for the Arts is minutes from the Chandler Homewood Suites by Hilton. The Desert Botanical Gardens and the Phoenix Zoo are a short drive from the hotel. The one- and two-bedroom suites at the Homewood Suites Phoenix/Chandler have kitchens and separate seating areas. The hotel also offers an outdoor heated pool and whirlpool. Some of the suites include a fireplace, and all have a refrigerator, stove top and dishwasher. Along with free cable TV and a DVD player, each room has a work desk and a dining area. The Homewood Suites Phoenix hotel in Chandler offers breakfast every day. Guests can enjoy the pool, whirlpool and 24-hour guest fitness center. The hotel has laundry facilities, with Wi-Fi and wired Internet access available. Easily reached from Interstate 10, Homewood Suites by Hilton Phoenix/Chandler is 2 miles from the Ahwatukee Lakes Golf Club. The hotel is 13 miles from the Phoenix Sky Harbor International Airport and the campus of Arizona State University is 15 miles from the hotel. Just off Interstate 10 and close to local area attractions including Arizona State University, this hotel provides a free daily hot breakfast buffet along with flat-screen HD TV's in all rooms. On-site at the Holiday Inn Express Phoenix/Chandler/Ahwatukee guests can enjoy a 24 hour fitness center and an outdoor swimming pool and whirlpool. 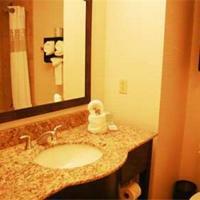 The hotel also offers wireless internet access and on-site laundry facilities. The Phoenix Zoo, Rawhide Western Town and the Gila River Casino are only minutes from the Phoenix/Chandler/Ahwatukee Holiday Inn Express. South Mountain Park, offering scenic hiking trails is also nearby. Featuring an outdoor pool with sun terrace, this Chandler, Arizona hotel is 25 minutes’ drive from Phoenix. Arizona State University is 15 miles away. Ocotillo Golf Resort is less than one mile away. Offering free Wi-Fi, each room provides contemporary white linens, a flat-screen cable TV, a spacious desk and free toiletries in the en suite bathroom at Holiday Inn Chandler. Coffee-making facilities are also provided. Chandler Holiday Inn features a 24-hour fitness center. A pool-side hot tub can also be enjoyed. Offering breakfast and dinner, Ponte Vecchio Café is onsite. Room service is available from 0600 until 2100. Arizona Railway Museum is 3 miles away. Phoenix Sky Harbor International Airport is 20 miles away from Holiday Inn Chandler. Only steps from the San Marcos Golf Course, this hotel in Chandler, Arizona features an outdoor pool, an on-site beauty salon and 3 on-site restaurants. Each guest room at the Crowne Plaza Resort San Marcos Golf Resort features a private balcony or patio. Guests can take advantage of the free wireless internet access available throughout the hotel or browse for souvenirs in the on-site gift shop. On-site dining is available at the 1912 Sports Lounge and AJ's Restaurant. Guests can also enjoy a cup of coffee at the on-site cafe featuring Starbucks coffee, relax in the whirlpool or rest in the beautiful courtyards. Historic downtown San Marcos is within walking distance of the San Marcos Crowne Plaza Resort. Several sports venues including Tempe Diablo Stadium and US Airways Center are within driving distance of the property. This Chandler hotel is 5 minute drive from the Fashion Center mall and 20 miles from downtown Phoenix. The hotel offers a restaurant, free Wi-Fi and outdoor pool. Guest rooms at the Courtyard Phoenix Chandler/Fashion Center feature a 32-inch flat-screen TV and work desk with ergonomic chair. The Courtyard Chandler/Fashion Center's lobby features a 52-inch touch-screen showing directions to area attractions. A hot tub and well-equipped gym with cardio and weight-training equipment are available. Open for breakfast and dinner, the Courtyard Phoenix Chandler's Bistro is on site. It offers cocktails, light meals and Starbucks coffee. This Chandler hotel is across the street from the Chandler Fashion Center mall. The all-suite property offers a hot daily breakfast buffet, free Wi-Fi and free on site parking. SpringHill Suites Phoenix Chandler/Fashion Center features a kitchenette and cable TV. Free local calls and work desks are also included in each of the spacious suites. Guests can benefit from an outdoor pool with jacuzzi. A 24-hour front desk and fully-serviced business center are also available on site. Downtown Phoenix is a 25-minute drive from the SpringHill Suites in Chandler. Intel Corporation is a 7-minute drive from the hotel. Located across the street from the Chandler Fashion Center, this Arizona hotel offers fully equipped kitchens in every suite. This all-suite hotel features an outdoor heated pool. Guest suites at the Residence Inn Phoenix Chandler/Fashion Center provide a dining area and a living area with a sofa bed and a desk. Free Wi-Fi and cable TV with CNN and ESPN are also available in the suites. The Residence Inn Chandler is pet-friendly and includes a gym. Services available include a grocery shopping service and dry cleaning. A buffet breakfast is offered at the hotel with an evening reception. Downtown Phoenix is 20 miles from the Residence Inn Chandler Fashion Center. The Phoenix Sky Harbor International Airport is a 30 minute drive from the hotel. This hotel is located in Chandler, 10 miles from Phoenix Sky Harbor International Airport. It has a heated outdoor pool with sun-lounger terrace, and offers spacious rooms with free Wi-Fi. Rooms at the Courtyard Phoenix Chandler include a large work desk with ergonomic chair and cable TV. They come equipped with ironing facilities, a hair dryer and coffee-making facilities. In the morning the Bistro Restaurant serves breakfast, dinner and cocktails. The Phoenix Chandler also features a 24-hour market, a 24-hour business centre and news updates televised in the lobby. Guests can relax in the hot tub, or visit the fitness center. The Courtyard provides laundry facilities, and offers a free daily newspaper in the lobby. The Courtyard Phoenix Chandler is one mile from the Desert Schools Coyotes Center Skate Park and Polar Ice Entertainment. Free public parking is possible on site. 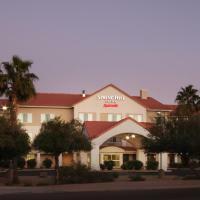 This Fairfield Inn is off of I-10, 12 miles from Phoenix International Airport and 7 miles from downtown Chandler. It features an outdoor pool and spa and free Wi-Fi throughout the hotel. All guest rooms at Fairfield Inn & Suites Phoenix Chandler come equipped with a flat-screen TV. Every room features a microwave and a small refrigerator. Each morning guests can enjoy a large continental breakfast, including coffee, fruit, cereal, waffles and the famous Jimmy Dean™ sandwich. There are also several restaurants within a short drive of the hotel Fairfield Inn Phoenix Chandler is just 1 mile from Ahwatukee Foothills Towne Centre, and Whirlwind Golf Club is just 3 miles away. Free on-site parking is available. Just a 5-minute drive from Ashley Manor and 10 minutes from the Chandler Center for the Arts, this hotel features an on-site restaurant called The Bistro, and an outdoor pool. Rooms feature free Wi-Fi and flat-screen TVs. The rooms at Chandler Fairfield Inn and Suites include a sitting area with a work desk. A coffee maker and hairdryer are provided. This Chandler, Arizona hotel includes a gym and hot tub. A free hot breakfast buffet is provided every morning. Safes are available at the front desk. Phoenix Sky Harbor International Airport is 30 minutes from Fairfield Inn and Suites Phoenix Chandler Fashion Center. Arizona State University is 15 minutes from the hotel. This Chandler, Arizona hotel is 3.7 miles from Wild Horse Pass Casino and serves a daily buffet breakfast. The 100% smoke-free hotel features rooms with a refrigerator and free Wi-Fi. 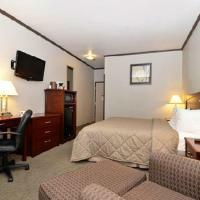 Chandler Executive Inn offers air-conditioned rooms furnished with a microwave and flat-screen cable TV. Each room comes with a work desk, coffee maker and hairdryer for added convenience. Guests of the Executive Inn of Chandler can swim in the heated outdoor pool or use the business center which has fax/copy services. The pet-friendly hotel features a 24-hour front desk, laundry facilities and free parking. Downtown Phoenix and the Phoenix Sky Harbor International Airport are 15 miles from the Chandler Executive Inn. The hotel is an 11 minute drive from Tempe Municipal Golf Course. Just 30 minutes from downtown Phoenix, Arizona and 15 minutes from Firebird International Speedway, this hotel features an outdoor pool, hot tub, and breakfast delivery to guest rooms. The Chandler Windmill All Suites offers suites with cable TV and free Wi-Fi. The kitchenette includes a microwave, refrigerator, and sink. A work desk and sofa bed are also provided. A continental breakfast is served every morning at this pet friendly Chandler hotel. A gym and business center are on site and guests can check out books at the hotel’s library. Free parking is available. Gila River Casino is less than 10 minutes from Windmill All Suites at Chandler Fashion Center. Phoenix Sky Harbor International Airport is 25 minutes from the hotel. This Hampton Inn, decorated in warm, bold colors, is less than 1 mile from the Santan Freeway and features an outdoor pool and whirlpool area with partly shaded deck. Rooms at the Hampton Inn & Suites Phoenix Chandler Fashion Center include free Wi-Fi access and a 32-inch flat-screen TV. A coffee maker and ironing facilities are also available. Work may be completed at the desk or on a bed with a provided lapdesk. A fitness center is open to all guests of the Phoenix Chandler Hampton Inn, featuring equipment, free weights and ample floor space. A business center and free beverage area are also on-site. Breakfast is offered each morning. The Pavilion Pantry Market is open 24-hours, selling snacks and gifts. The Hampton Inn Fashion Center is less than 11 miles from Golfland Sunsplash and less than 10 miles from Rawhide Western Town & Steakhouse. Near I-10, this Candler hotel is one mile from Lone Butte Casino. It offers self-catering apartments with free Wi-Fi as well as a spacious free-form pool. Hawthorn Suites by Wyndham Chandler serves a hot breakfast buffet every morning. An evening social with food and refreshments is available Tuesday through Thursday. Recreational facilities at the Chandler Hawthorn Suites include an outdoor jacuzzi, barbecue area and a modern gym with cardio equipment. A 24-hour business center with computers and a printer is also available. 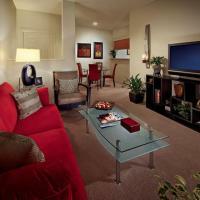 Sky Harbor International Airport is 10 miles from the Hawthorn Suites. This Chandler hotel features an outdoor pool, continental breakfast and free Wi-Fi. All rooms include a microwave and refrigerator. Pueblo Grande Museum and Archaeological Park is a 20-minute drive away. Rooms at Chandler Best Western Inn offer cable TV with HBO, a coffee maker and seating area. Ironing facilities and a hairdryer are also provided. Guests can relax on the outdoor sundeck or in the whirlpool. Best Western Inn of Chandler has free newspapers and a public computer station in the lobby. Tempe Diablo Stadium is a 20-minute drive from Best Western Chandler Inn and the Phoenix Zoo is 16 miles away. The corporate office of Intel is 15 minutes’ drive away. This Chandler Hilton, next to the Fashion Center, features a café, restaurant and bar all on-site. A spacious outdoor pool and patio are open all year. All rooms at the Hilton Phoenix Chandler are decorated with granite countertops and dark wood furnishings. Free Wi-Fi and a 32-inch flat-screen TV with premium channels are available. Rooms also include an alarm clock radio with MP3 connection, a work desk with eye-level outlets and a Cuisinart coffee maker. Taste An American Bistro restaurant serves contemporary meals throughout the day, and the R Bar serves drinks and appetizers each night. The Café 2929 serves Starbucks coffee drinks every morning. The Chandler Phoenix Hilton provides a fitness room and whirlpool for guest use. Transportation is available to local destinations. The Hilton is 6 miles from the Ocotillo Golf Course and less than 20 miles from Phoenix Sky Harbor International Airport. Located off Interstate 10, this Chandler, Arizona hotel offers guests a year-round outdoor pool and free Wi-Fi in every room. Phoenix Sky Harbor International Airport is 20 minutes’ drive from the hotel. 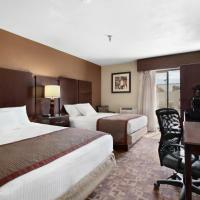 Offering cable TV, each temperature-controlled room offers a seating area at Comfort Inn - Chandler. Carpeted floors and tea and coffee-making facilities are also provided. A daily hot breakfast featuring waffles, eggs, meat, yogurt and fresh fruit is included. Free parking is available to guests at Chandler – Comfort Inn. A 24-hour reception is also provided. Lone Butte Casino is a 2 mile drive away from Comfort Inn - Chandler, while Firebird International Raceway is 3 miles away. Arizona State University is 20 minutes’ drive away. Located 4 miles from Chandler town centre, this Arizona guest accommodation offers an outdoor pool, a fully-equipped kitchen and free Wi-Fi. It is 10 minutes’ drive away from the University of Arizona. The guest accommodation at Bridgestreet at San Palacio offers a flat-screen TV, a DVD player, a washing machine and tumble dryer and a work desk. The tastefully decorated rooms have plenty of space for dining and relaxing and the fully-loaded kitchen includes a dishwasher and tea and coffee-making facilities. The common area at Chandler Bridgestreet at San Palacio offers a custom outdoor pool, a 24-hour fitness centre, a business centre and BBQ facilities with a guest picnic area. A children’s playground and a sun terrace are also available. Ocotilla Golf Course is 4 miles away. Phoenix Sky Harbor International Airport is 25 minutes’ drive away. Located off Interstate 10, this hotel features an outdoor pool and guest rooms with free Wi-Fi. A hot breakfast featuring waffles, muffins and fresh fruit is served daily. Firebird International Raceway is 3 miles away. A flat-screen cable TV is provided in each air-conditioned room at La Quinta Inn & Suites Phoenix Chandler. Each pet-friendly room features a sitting area. A coffee maker, a hairdryer and ironing facilities offered in all guest rooms. Guests of Phoenix Chandler La Quinta Inn & Suites can enjoy a workout in the fitness center. For convenience, a guest laundromat is offered on-site. A business center is available. Wildhorse Pass Casino is a 6 minute drive from this hotel. Central Phoenix is 15 miles away. Legacy Golf Resort is 9 miles from this La Quinta Inn. Located 3 miles from Firebird International Raceway, this Chandler motel features an outdoor pool. It serves a daily continental breakfast. All of the air-conditioned guest rooms have free Wi-Fi. A flat-screen cable TV is offered in each guest room at Super 8 Chandler. For guest convenience, all rooms provide a work desk, a microwave and a refrigerator. A 24-hour front desk is offered to guests of Chandler Super 8. Guests can work out in the on-site fitness center. Free truck and bus parking is available. Rawhide Western Town is 4 miles from this Super 8. Legacy Golf Resort is a 15 minute drive away. A seasonal outdoor swimming pool is featured at this Chandler motel, just 4 miles from Chandler Fashion Center. Free Wi-Fi is included in each air-conditioned guest room. A compact fridge and microwave are provided in each guest room at Chandler Inn. A cable TV is also offered. Vending machines provide late-night snacking options. Free parking is included. Tempe Diable Field is 14 miles away. Phoenix Sky Harbor Airport is 18 miles away from Chandler Inn.